Like any sport, motocross riders develop their gear preferences over the lifetime of their career. Some decide they want more impact protection, some less. Some find stiffer retention systems to their liking, others prefer increased flexibility. It's a matter of riding style and comfort. Alpinestars refers to their Tech 3 as a boot designed for entry-level riders, because the Tech 3 provides a moderate level of everything. For protection, the Tech 3 sports contoured, PU-injected plates over the shins. These provide excellent impact and abrasion resistance. The boot upper is leather with thick stamped suede on the inner side for grip and heat resistance. Beneath the suede is plastic reinforcement for added safety. Additional plates and braces protect the toe and ankle. A double density high-grip sole is shaped for the foot and includes a tempered steel shank. The retention system consists of four impact-resistant polymer buckles. These buckles feature a memory system for quick lock and release and consistent fit. The top of the boot has a gaiter and velcro strap with elastic PVC. This (along with the foot bed, poly-fabric lining, and multi-density EVA) will all support the comfort of the rider in wet or dry conditions. So, like I said, a little of everything. You might find these a little on the stiff side due to the combination of safety features. 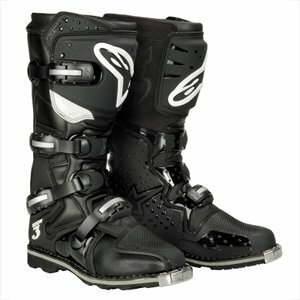 The price is also about half what you'd pay for a top-tier motocross boot. This is a great way to get your toes wet and find out if the sport is going to stick with you. Although, some seasoned riders buy these for the excellent value.